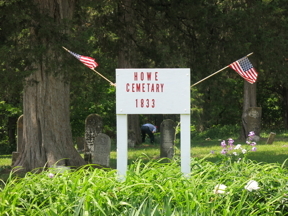 We drove up to the Howe Cemetery in Warren Township, Marion County, about two miles north of the old town (no longer in existence) of Sharpsburg. It had rained recently and the road was a narrow gravel road. We attempted turning around at the Cemetery and became stuck in the mud at the side of the road. Since there was no cell phone service, we walked about a quarter mile to the Kennison Taxidermy, where we found someone with a land line. 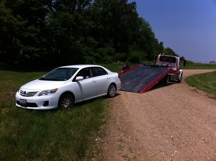 He looked up the number of the Hannibal towing company and they arrived about an hour later to pull us out. At the Howe Cemetery we easily found the marker for Pricilla Stasey’s grave. It is slanted, face forward, toward the ground, but was readable. Other stones of the same age were mostly unreadable and hers was preserved because of the protection from the elements offered by the tilt. 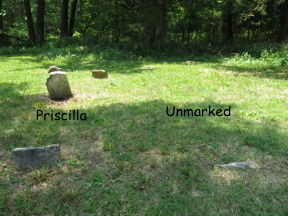 There is an unmarked grave next to Priscilla’s with others some distance away. 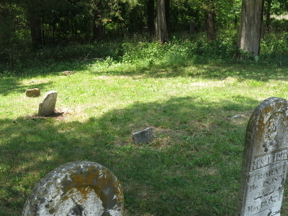 The two graves may be purposely together. 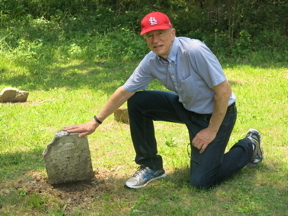 It is plausible that this unmarked grave could be the burial site of Priscilla’s father, Thomas Hart Benton Stasey, who was killed a month before she died. We took some pictures of the cemetery and drove south to locate the Young burial ground mentioned in the Find A Grave web site.